Murrieta Police have released a series of surveillance photos in seeking the public's help in identifying a man suspected of two bank robberies in the area. The first robbery took place March 19. According to a news release, officers responded to the Visterra Credit Union at 25040 Hancock Ave. at 9:54 a.m. Employees told officers a lone male entered the credit union and walked up to the bank teller with his hands in his pockets. The suspect then handed the teller a note demanding money. No other patrons were inside the credit union at the time of the robbery, police said. No employees were injured. The suspect fled on foot with an undisclosed amount of currency toward the Stater Bros. grocery store. 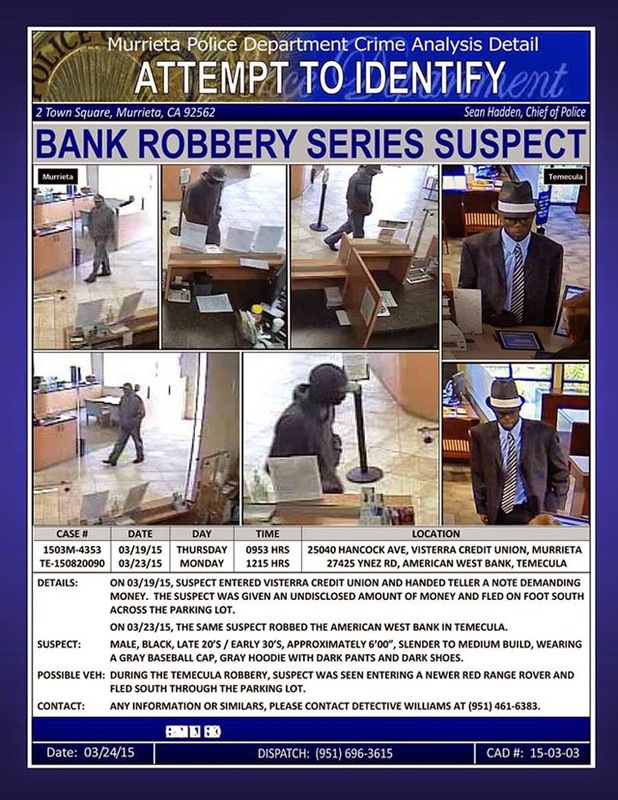 The same man is suspected in a robbery of the American West Bank in Temecula on March 23. Anyone with information regarding this case should contact Detective Williams at 951-461-6383.